FOSTER CITY, California, April 1, 2019 /PRNewswire/ — Reviver, creator of the Rplate, the world’s first digital license plate platform, has been selected as a global leader for Smart License Plates and received the award for Best Smart Transportation Solution at the 8th International Smart City Expo in Dubai, UAE. The 2019 Smart City Conference & Expo Awards recognize the best in IoT and Smart Cities Application Development. The Rplate is already on the roads in California and Arizona in the United States, with more states to follow and is expanding its reach globally, including to the United Arab Emirates. 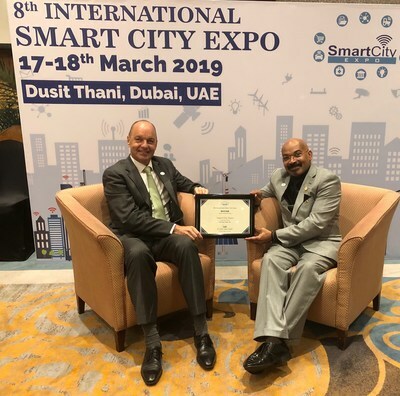 “We are pleased to have selected Reviver as a Global Leader in Smart Transportation solution during the Smart City Expo in Dubai,” said Dr. Hafiz Yasar Lateef, Director and Founder of Smart City Expo. The Rplate was on display at the 2019 Smart City Expo at the Dusit Thani, Dubai, UAE on March 17th and 18th, joining companies and attendees from around the world. The expo featured a showcase of innovative solutions and services from leading technology companies. The event combined a collocated conference, covering Smart City Vertical applications, urban planning technologies and international authorities responsible for developing urban policies. Launched onto the road in California in June 2018, the award-winning Rplate transforms the 125-year old stamped metal license plate into a sleek, digital, high-definition display, offering a connected car platform to simplify daily life, with vast potential for future innovation and Smart Cities integration. To expand the promise of Smart Cities globally, Rplate is working with international technology partners including Harman and Wistron NeWeb, with a mission of helping to solve the problems that arise from archaic processes, via a platform that connects cities, consumers and agencies. Reviver has also partnered with SEED Group, and the Private Office of Sheikh Saeed bin Ahmed Al Maktoum, to further extend the global reach of the Rplate.